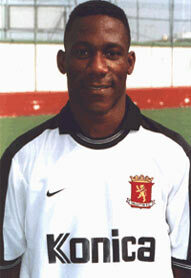 Chris Olusola Oretan was imported into Malta by Naxxar Lions in season 1998/1999. During his stay with Naxxar Lions he played in 44 matches and scored 14 goals. After a 2-year spell with Naxxar L., Oretan joined Valletta FC in season 2000/2001. He formed part of the record-breaking Valletta squad that won six honors out of six in domestic competition (Premier League, FATrophy, Super Cup, Super 5, Lowenbrau Cup and Centenary Cup). That season was Oretan's best year out of three with the club, scoring a total of 22 goals out of 28 matches. In season 2001/2002, Oretan scored a total of 15 goals out of 25 matches, whilst in season 2002/2003; he scored 12 goals out of 26 games. Chris Oretan left Valletta FC in season 2002-03. In 2003, Oretan joined NK Slaven Belupo, Chris failed to make his mark in Croatia following a dispute with his foreign manager over the size of his fee from the contract. Chris moved to Greece and joined Doxa Drama one of the oldest clubs in the country. All started well for the Nigerian striker until the club was on the verge of bankruptcy. In January 2005 Chris returned back with the Citizens, he played in 13 matches and scored 4 goals. At the end of the season Chris left Valletta F.C. and joined BV Cloppenburg, a German football club located in Cloppenburg, playing a total of 6 matches and scoring two goals. In the following season he moved to FC Kotzting, a club based in the city of Bad Kotzting in Bavaria. Chris took part in 22 matches and scored 6 goals. In season 2007-08, Chris remained in Bavaria with FC Kotzting making a total of 18 matches and failing to continue the season through an injury scoring only 3 goals during the season. Chris changed his position and started playing as a midfielder on the right. In season 2008-09, Oretan joined Gross Hadern, a club located in Germany, scoring 8 goals and playing 32 matches as a midfielder. Season 2009-2010 till today Chris is playing with SV Heimstetten. He scored a total of 9 goals from 30 matches; he also won the league and got promoted to the next league. From 2010 till the end of 2011, Chris suffered a series of bad luck with an injury and was not playing regularly. In season 20010-2011, he scored 4 goals in 20 matches.